Blog — Real Chicks Rock!! Some people are good at doing some things and then there are some that are great at doing almost everything they put their hands on. This dynamo lady that hails from Detroit, Michigan is no different. Jessica Care Moore can almost do it all. Well, whatever she puts her mind, heart and hands to do she does well. What’s Life Like Living with Lupus? Often times we think about Cancer and Diabetes as diseases that impact us the most. Well, we shouldn’t disregard the power that Lupus has on the individuals it tries to attack. RCR! Presents Real Discussions talked about What’s Life Like Living with Lupus with two women who refuse to lose. They are not just survivors, but winners. My guests Joelle May and Adrienne Allende have decided they would not lose in the daily battle with Lupus. These ladies have decided to win each new day that they’re given. Yes, it’s like that! It’s a daily decision to want to beat it and not give in to how you might be feeling. The interesting thing about this is that both of these women were diagnosed with Lupus at different times in their lives not knowing that they had anything wrong with them to begin with. It has changed them both immensely where some of things that wanted to do and/or used to do can no longer be considered an option. Having children, relationships, careers, etc. are we’re tough decisions that had to made in order to focus on their health each and everyday. Lupus is a complicated and unpredictable disease. You don’t know when symptoms will strike or how long a flare could last. The uncertainty of how you can be impacted will very from day to day and throughout the course of the day. To make a donation to the local chapters, go Lupus.org. Feel free to learn more about Lupus and the women who have decided to fight everyday on the Real Chicks Rock! YouTube channel. People come in all different shells, templates and forms. None of which can help determine if mental illness is being challenged or at risk. People have learned to how to cope, maneuver and get by with whatever state of mind they might be in. Mental health is a serious topic, but yet still continues to be taken lightly. RCR! Presents Real Discussions discussed this topic with two experienced therapists within the mental health industry. Erica Strayhorn James of EJ Counseling and Nathalie Ellis of Esteem Counseling Services were very knowledgeable about the different types and forms of mental illness. What I found to be interesting is that they have clients that are young as 3 years old. The ladies had several examples that they shared to help enlighten us about what mental health is really all about. A few things that are helpful in dealing with mental illness is journaling daily. This will help in expressing what the person is feeling and dealing with. Equipping people with information and educating the person about their choices, outlets and strategies are a good practice. Lastly, just practicing self care routines everyday will also help combat in battling mental illness. It’s also helpful to involve loved ones in the educational process. Like any other illness, getting love and support will help manage any situation better. Keep in mind that individuals can get to see a therapist just like seeing a primary care physician. Don’t struggle to get mental wellness on your own. The Many Phases of Cancer. We have the audacity to think that when people have cancer, they should begin to look a certain way. Especially when they have stage 4 cancer. We have a lot of nerve. Nickole Justice and Deborah Huddleston don’t look sick at all. They are two beautiful women, they are mothers and they are dealing with stage 4 cancer. Neither one of the women knew that they had cancer. They weren’t feeling well and went to the doctor. For Nickole, they told her that she was too young to have cancer. Therefore, the opportunity to diagnose her cancer early and catch it was missed. Deborah had been running her own business, took care of many and carried on her day to day routine. She too wasn’t feeling well one day and decided to go and get checked out. You can only imagine that this was life changing for both women. Their jobs. Their careers. Their families impacted. These ladies don’t have time to be scared because they are in a fight for their lives every day. Healthcare that’s afforded to them is not enough and it’s a constant battle to acquire and maintain coverage. Their families have stepped in to help provide the support they need. And yet they still fight. They won’t quit. They want to live. Despite everything that was thrown at them, they were winning until we lost one of them. On Sunday, June 10, 2018, we lost Nickole Justice to stage 4 cancer. She leaves behind her 10-year daughter nicknamed Nurse Peaches, her parents, family, and friends. It was my honor to meet her and have her and Deborah on RCR! Presents Real Discussions on Sunday, May 20th. We extend our prayer and condolences to her family and we’re so thankful to have met her. Thank you Nickole for sharing your battle with us, it will be used to help others. Be prepared, know what you want and put in the work. In my recent years, I've come across a few DJs and some leave their mark. This one is no exception. DJ Stacey Hotwaxx Hale is a bad girl because she plays as if her life depends on it. This talented DJ and Producer has been involved with music since she was a little girl. One of the 1st woman to mix and spin on reel to reel in Detroit. This woman had many 1st and remains just as humble about it all. Her life story has always involved music. Detroit is her home and will always be. In my conversation with Stacey, she shared a lot of stories, experiences, her love for buying vinyl and shouted a lot of people out. Stacey is not only passionate about music, but she’s also passionate about passing on all that she knows to others. She’s a teacher, a motivator, a giver and a passionate person. This lady is one of the kind and will be remembered for all that she's done. What a night! We’d like to thank everyone that came out to support The Connection- Behind The Groove Event where proceeds went to MS. Every little bit will help to make a big difference. Health and Wellness are 2 words, we like to see go hand and hand. Especially, when it’s the beginning of a new year. We are becoming more and more aware of our food options and choices. The pesticides and steroids that are placed on and in our foods are unacceptable. Chef Jamel Thompson and Jackie and Janae Madison were very passionate about what we eat, how it’s prepared, the portions and making sure we exercise. His vegan food leaves your mouth wanting for more as the taste is incredible. Jackie and Janae Madison is a mother and daughter combination that enjoys exercising and stay well together. The 6-year-old Janae holds her Mom accountable by making sure they exercise every day together. Jackie coaches people to eat appropriate portions. Both Jackie and Jamel would agree that if you’re going to eat meat, make sure it’s a good cut and the right portion. Don’t overdo it. Both these professionals can now offer help on what and how to eat. Most people would agree that all the exercising will be without value without the proper diet and food portions to go with it. Everyone one is different, so govern yourselves accordingly. - Make decisions about what and how you eat food that best suits you. - You gotta keep moving, stay active and mobile. Unique thing is that this is more than just a 5k Run but it’s designed to empower young ladies. The Chocolate Cupcake Lifestyle brand is an exciting new character-driven lifestyle brand that centralizes tween girls of color in the consumer marketplace. Through their lovable animated characters, books, media, fashion, music and life experiences they encourage girls to live life with Courage, Confidence, Creativity, Compassion and Character. Founder Lynda Osborne is excited about the direction the brand is heading and is always wanting to align with others that see the vision as well. We were honored to be a sponsor at this year’s 3rd annual CupCake Run 5k. The energy was infectious and we’re so looking forward to participating as a sponsor next year. When women from all walks of life come together to support each other in the area of their business, it becomes a day that will stay with you for quite some time. 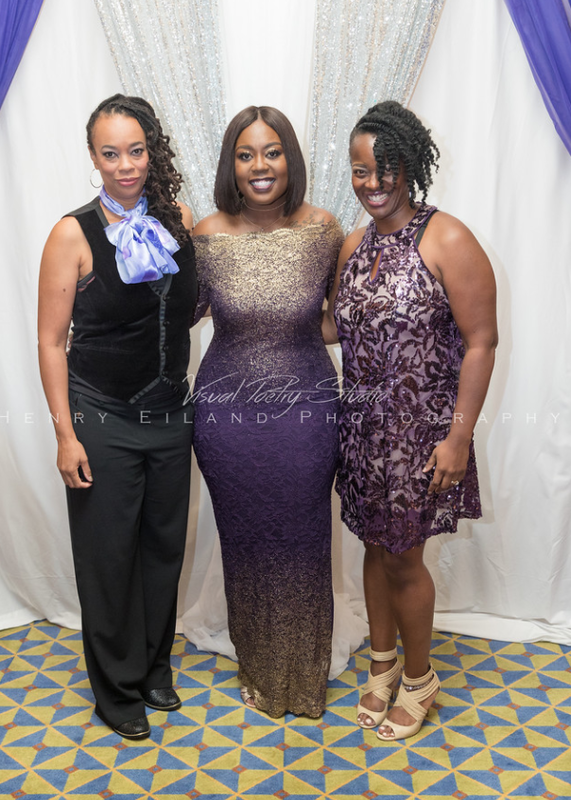 Purple has always been my favorite color and sees it on a sea of empowered women always puts a smile on my face. The date was Saturday, October 14, 2017. The location Columbus, GA Trade and Convention Center. 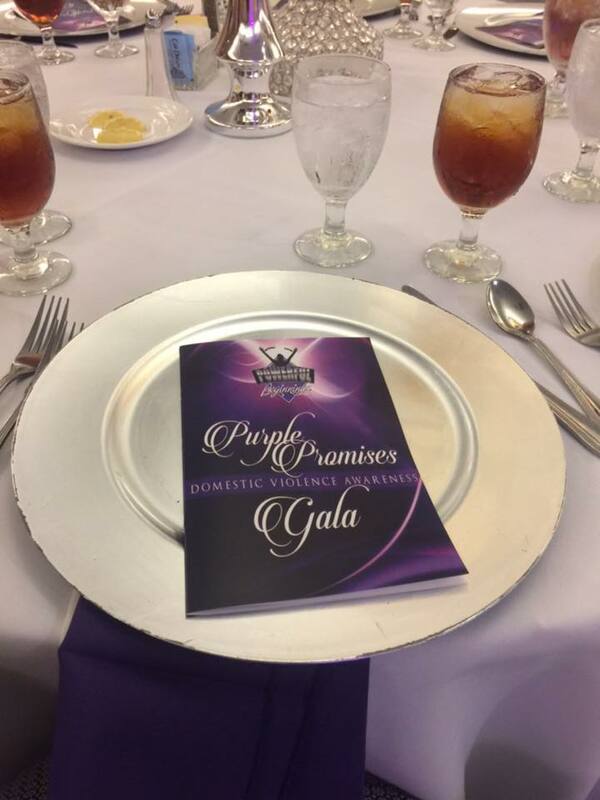 The Event is Purple Promises Domestic Violence Awareness Gala. Women and men gathered in one place for a night of celebration, newness, and life. Everyone looked beautiful as the pictures were being taken, compliments were given and hugs were exchanged. Twelve (12) women were honored for their commitment to change for themselves by saying no more to enduring a domestic violence situation. Founder of Powerful Beginnings ~ Monika Thornton was no exception to the rule. As a domestic violence survivor herself, when she made the decision to endure it any longer, she knew she wanted to help others once they made the transition not to go back. Powerful Beginnings have been doing some impactful things in the Columbus, GA area so when they asked me to be the Mistress of Ceremonies, I couldn't resist. It was a wonderful night and experience for me. Meeting wonderful people, both survivors and supporters made it a night to remember. This past Sunday, on RCR! Presents Real Discussions, we identified some of the challenges and opportunities in dealing with our young girls. My guests Lynda Lee Osbourne and Katina Cunningham were filled with ideas, solutions, and programs that could help our young girls navigate through this thing called life. Feel free to check out part 1 and 2 of the show on my Facebook timeline and/or the Real Chicks Rock!™ YouTube Channel. Thanks to Instinct Radio letting us have the dialogue. Thank you, Lynda and Katina, for being so passionate about what you do, developing programs that promote character building and technical skills. We look forward to hearing more about your upcoming programs and supporting it any way we can. Don’t give our children a lot of responsibility and take it back when it’s convenient for you. Have conversations with your children on a regular and/or daily basis. Create the change you want to see not only for your own children but for others as well. You'll have to check out the interview to hear how FunkJazz Kafe® was birthed, all the people that Jason gives credit to and where his inspiration came from. His film FunkJazz Kafe® ~ Diary of a Decade is a critically acclaimed must see so, when it comes to your city, don't miss it. It captures 10 out of the 23 years of the FunkJazz Kafe® era. Thank you, Jason Orr, for sharing and spending time with us. Thanks to Instinct Radio for letting us break this bread on air. And thanks to you, you and YOU for listening, liking, sharing and showing support. Feel free to view all 3 parts of this conversation on my timeline or on the Real Chicks Rock!™ YouTube Channel.